A heat recovery unit allows the internal air renewal of the premise, maintaining and recovering the energy used for air conditioning. The main objective of a heat exchanger or heat recovery system is the recovery of the energy by transferring the heat of the air that is extracted from the inside of a premise to the air that is driven outside. 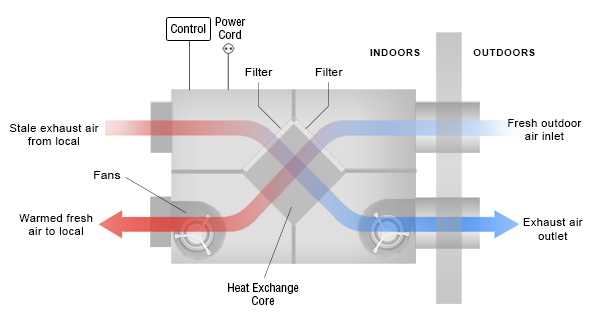 A heat recovery unit is basically composed of a directly driven fan, an exhauster and a heat exchanger, all perfectly assembled and joined inside a thermal and noise insulated structure. The internal extraction air circuit pass by the exchanger without mixing with the circuit of the external driven air. Through heat exchanger ventilation it is possible to recover a high percentage of the energy used for the premise acclimatization that otherwise would waste.